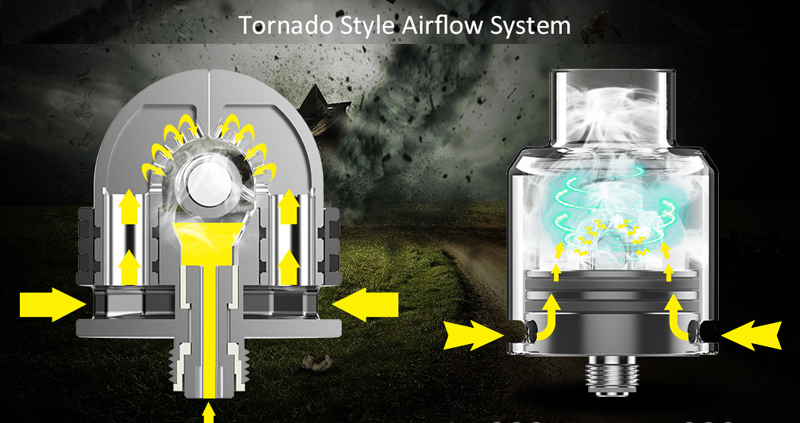 Hey folks, have you seen the Tornado Style system RDA? It will be the new technology for the vape RDA. ElegoMall here presents you a unique RDA that is HugsVape Ring Lord RDA. Let us check out more details about it. HugsVape Ring Lord RDA is a 27mm diameter single coil deck Tank that is made of Stainless Steel and glass material. The Ring Lord RDA adopts ring-like air tube above the single coil build deck to bring smooth airflow and optimal flavor. 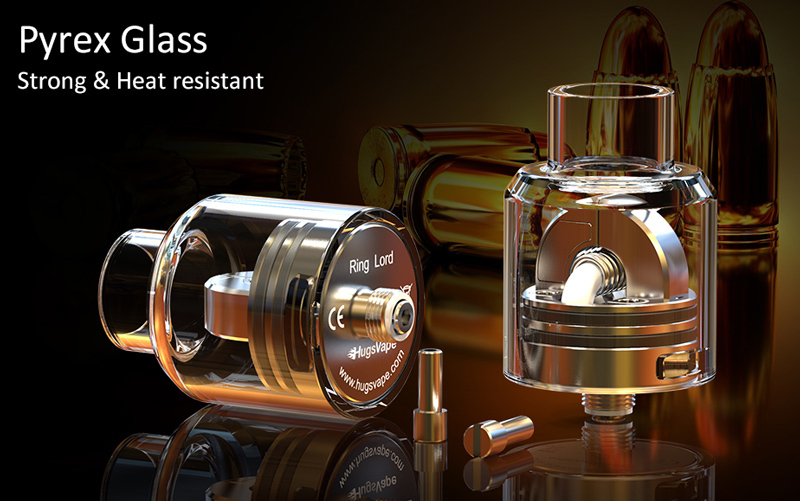 The top cap of Ring Lord RDA is clear glass, making the device attractive in visual experience. The Ring Lord supports single coil building with the tornado-style airflow system. It also comes with a bottom feeder pin to fit the squonker MODs. Here recommend some great RDAs for you. Vandy Vape Pulse V2 RDA is a 24mm diameter atomizer that supports the single and dual coils. It includes three different airflow rings that bring you the optional flavor. The Pulse V2 RDA adopts an innovative floating deck, which supports top squonk feeding and bottom juice return design. Easy to build and avoid leakage. You can enjoy the different vaping experience. The Bonza V1.5 RDA has bigger Posts, Screws, & Plates. It has a Raised Squonk Pin. There is a locking system for the Top Cap. It has a 9mm Juice Well. It now has Dual Air Flow Control (AFC) Options. This is a 24mm RDA (Diameter) by 25.5mm Length/Height. It is completely detachable with these parts: Resin Drip Tip, Adjustable Airflow Ring, Airflow Cap, Build Deck, 510 Pin Gold Plated, & Squonk Pin. The Vandy Vape Paradox RDA features a two post clamp style build deck that is designed to fit larger coil builds. It features a dome bell top cap design to optimize airflow for increased vapor production. The annular airflow design allows for even purer flavor and vapor. The Paradox features a direct airflow to coil design which may be adjusted using adjustable airflow top cap. The Paradox RDA arrives with three drip tip styles to choose from based on your personal preference. A 510 drip tip adapter and a pre-installed bottom feeding squonker pin are all included with the Paradox RDA. Wotofo Profile RDA is a 24mm diameter mesh compatible rebuildable atomizer. Utilizing a dual ceramic clamp technology, the Profile RDA creates a wide build area, offering a multitude of build configurations including mesh heating elements. The Profile RDA also features a honeycomb airflow configuration, fully adjustable with the top-cap chimney to create the best vaping experience. The Profile RDA also features a gold plated 510 BF Squonk Pin Pre-Installed for squonking right out of the box. Different RDA has a different function to meet your daily vaping need. Which Vape RDA would you prefer?